Increase vocabulary by exposing them to new and less common words not typically used in everyday conversation. Become familiar with new concepts and ideas, which increases background knowledge and leads to greater reading comprehension. Practice oral language skills as you take turns reading aloud and talking about the books you read. Increase fluency: the ability to read quickly and accurately with appropriate and meaningful expression. Discover the pleasure of reading and develop into a life-long reader and learner. An added benefit of reading aloud is that you communicate to your children how much you enjoy reading and the time you are spending with them. Making connections is like building a bridge from the known to the new. When you read together, help your second grader make connections between his or her own experiences and what characters are experiencing in a book. This will help your child understand a character's motives and feelings and will lead to a better understanding of the story. 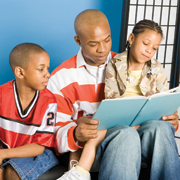 Reading with your child is a perfect time to talk about things that happened to you as a child or experiences that you have had as an adult that relate to the story. Some of the books you read with your second grader may have been favorites of yours as a child. Talk to your child about what that story meant to you. This can be a launching point for family stories, family lessons and lots of family discussion. Use the five senses to help your second grader visualize the story you're reading and "make a movie" in his or her mind. Talk to your child about how an author is able to "paint a picture" with their words. This increases your child's understanding of the story, stimulates imaginative thinking and brings joy to reading. As you read a story with your child, point out words and phrases the author uses to paint that picture in their mind. Books can take you away to distant lands and offer up sights, sounds, tastes and smells from this and other worlds. Take the journey with your second grader. Inferring is sometimes called "reading between the lines." Explain to your child that authors don't always come right out and tell you what is going to happen or how something happened. Sometimes the reader has to make a guess based on the information the author has given. This can lead to different conclusions, based on the experience and background knowledge that a reader brings to a story. Different readers might come up with different lessons to be learned from the same story. Inferring allows readers to make predictions, evaluate, reflect and make their own discoveries within a book. What happened in the story that made you think that? What would you have done if you were the main character in the story? Remember - there is no one right answer to these questions, but discussing the questions will lead to a deeper understanding of the story and a better understanding of how your second grader thinks. Your second grader is synthesizing information when he combines something he learned from reading a story with his existing knowledge to produce an original idea, observation or opinion. A story is full of information, just like pieces of a puzzle. A good reader is able to take all the information, put it together, sift out the unimportant details and understand the "big idea." Synthesizing helps your child think critically and creatively about what she reads and leads to deeper understanding of a story. Can you tell me the most important things that happened in the story? How could you take what you learned from this story and make it help you in your life? Did this story give you any ideas that you didn't have before we read it together? I wonder why the author wrote this story?